Chain Fern For Sale Online. Wholesale Prices. Fast Ship. If you are searching for a hardy perennial, the Chain Fern is an excellent choice. Distinguishable by bright to dark green, long, thin leaves that extend from the many stalks of the plant, it receives its name from the chain-like appearance on the underside of the leaves; Since this plant neither flowers nor bears fruit these chain-like spores are the seeding system for the fern. This is one of the most abundant species of fern, growing approximately 6 feet tall, but in damp climates can reach up to 9 feet. It varies in width from 3 to 9 feet. With an average of 5 years to reach its full maturity it is best grown in USDA zones 8 and 9. Being a low maintenance plant, it requires little more than consistent watering, making it ideal for novice gardeners. Also, as the plant grows the fronds (leaf structures) will die out and need to be cut back to benefit the rest of the plant. 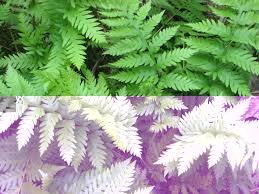 When planted in gardens, the fern prefers shaded areas or areas of dappled sunlight, with acidic, fertile soil. Although a hardy plant, the Chain fern does best in warm to hot, moist climates where frost is rare. In ideal situations, temperatures should not reach less than 15 degrees Fahrenheit (9.5 Celsius) for this plant to thrive. Chain fern or netted chain ferns are similar to the sensitive fern. This fern has fronds that are netted in appearance and look very intricate. The leaves are skinny, narrow and pointed at the top. Chain fern is also known as Woodwardia Areolata. Hardy planting zones are 3-9. The growth of this fern is up to 3 feet tall. The fronds are very delicate looking, but in fact, they are quite hardy and hardy to damage. This fern can provide one with lots of shade and looks well planted alongside with other perennials. This fern is classified as both a groundcover because it is low growing and a fern because of its looks. It can be seen growing from the North coast to the west coast. It cannot tolerate drought or heat and prefers a stable temperature. It can grow up to 3 feet wide. Such a large spread! Full of color! Good choice by far!